Feeding your need for fresh food and beauty with naturally grown herbs, heirloom vegetables and old fashioned flowers. When we think we have worked hard, we consider how hard these ladies work to bring us an abundance of flowers, fruit and vegetables. 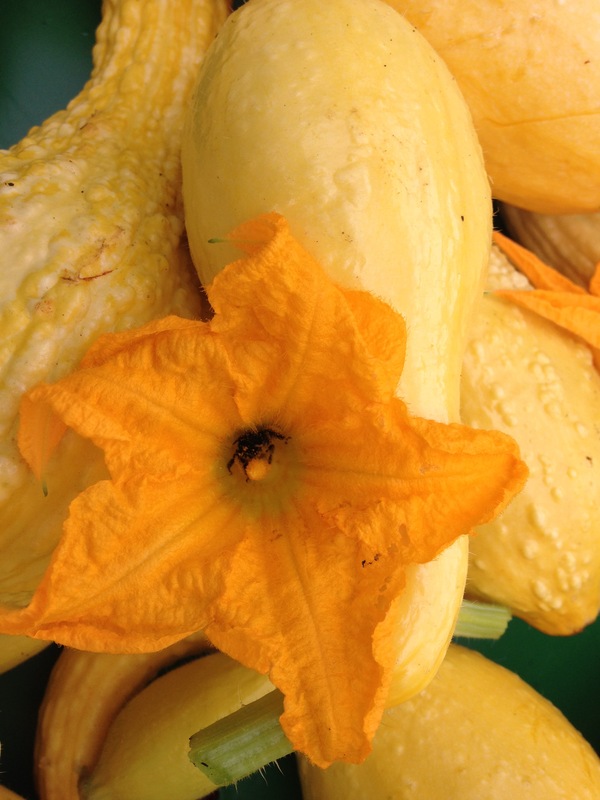 Heirloom yellow crook neck squash with honey bee in the squash blossom. JC does a hive inspection of our honey bees. Helping friends with helping hands. A beautiful morning harvest the third week of June. First harvest of Vit Mache in our high tunnel in 2016. We still don’t know how to pronounce it. Grant helps us harvest and present the vegetables, herbs and flowers to our market customers. A customer from the King Farmers Market marinates an uncooked tomato sauce with two tomatoes from Farmhaven and one from her garden.